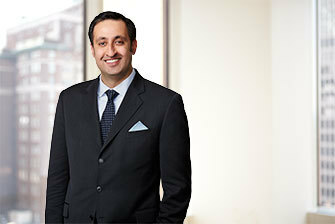 Aziz Burgy, a registered patent attorney, has nearly two decades of patent litigation experience, serving as lead counsel to clients in a multitude of venues including U.S. district courts, Patent Trial and Appeal Board (PTAB), U.S. Court of Appeals for the Federal Circuit (CAFC), U.S. Court of Federal Claims, and the U.S. International Trade Commission. Aziz’s practice focuses on the Hatch-Waxman Act, having litigated over seventy such cases in the last ten years. Although many of his cases have focused on pharmaceuticals, he has also represented clients in the banking, medical device, Internet security, robotics, software, and GPS technology industries and has handled other matters beyond patent disputes, including trademark and copyright cases. Before attending law school, Aziz worked as a research associate at MedImmune, Inc., a leading biotechnology company. During his time there, Aziz worked on the development of a humanized monoclonal antibody (palivizumab) with activity against respiratory syncytial virus and a vaccine consisting of self-assembling, virus-like particles for the prevention of human papillomavirus (HPV) infection of the genital tract and associated cervical cancer. Aziz draws on his industry experience, advanced life sciences coursework, and his vast legal experience to provide him the technical and legal expertise necessary to succeed in scientifically complex matters. Aziz is a frequent lecturer on U.S. intellectual property rights, with an emphasis on Hatch-Waxman issues. He has also taught classes on intellectual property at George Mason University. Not only is Aziz at the forefront of patent jurisprudence, he has also helped shape legislation related to patent laws. Specifically, Aziz has advised clients and Congress on various patent legislation matters dealing with the America Invents Act (AIA). Aziz is a member of the Maryland Bar Association, the District of Columbia Bar Association, PTAB Bar Association, the ITC Trial Lawyers Association, the Federal Circuit Bar Association, the American Intellectual Property Law Association, and the American Bar Association. Insys Therapeutics, Inc. v. Par Pharm., Inc., 17-cv-01078-LPS (D. Del.). Represented generic drug manufacturer, Par, in Hatch-Waxman litigation involving multiple patents directed to FDA-approved cannabinoid (Syndros®) used to treat anorexia in people with AIDS. Secured dismissal of case based on non-infringement position resulting in Par having the ability to launch upon approval of its ANDA product. Purdue Pharm. Prods. L.P. v. Actavis Elizabeth LLC et al., 12-cv-05311-JLL (D.N.J.) (“Intermezzo”). Represented generic drug manufacturer, Par, in Hatch-Waxman litigation involving two patents directed to the treatment of insomnia when a middle-of-the-night awakening is followed by difficulty returning to sleep. The district court invalidated the two patents-in-suit at trial and the Federal Circuit affirmed on appeal. Jazz Pharm., Inc. v. Par, Pharm., Inc., IPR2015-00548, -00551, & ‑00554 (P.T.A.B.). Served as lead IPR petition counsel orchestrating the drafting of multiple inter partes review petitions for three REMS patents directed to Jazz’s narcolepsy drug, Xyrem®, leading to invalidity of all claims on obvious grounds. The holding was later affirmed by the CAFC. Certain Bulk Welding Wire Containers and Components Thereof and Welding Wire, 337‑TA‑686. Represented Respondent accused of infringing six patents related to bulk weld wire containers. After trial, the case resulted in Complainant dropping five patents, invalidation of one claim, and a non-infringement ruling against all accused products. The case was affirmed on appeal to the Federal Circuit. Cross Medical Prods., Inc. v. Medtronic Sofamor Danek, Inc., No. 05-1415 (Fed. Cir. Mar. 20, 2007). Represented Defendant Medtronic in a patent infringement case involving six patents directed to spinal implant technology. CAFC reversed the district court’s finding that Medtronic’s modified surgical screw infringed the claimed seat means limitation under the DOE, and affirmed the district court’s grant of summary judgment of noninfringement on a claimed anchor seat. Tulip Computers Int’l v. Dell Computer Corp., 00-cv-00981-KAJ (D. Del.). Represented patentee against Dell Computer on a patent involving computer motherboard technology. Case settled for $49.5 million after one week jury trial. Aziz co-wrote “Slow Down Before Accelerating: Litigation Ramifications of Accelerated Examination Procedure on Nanotechnology,” The SciTech Lawyer; Summer 2007 (Vol. 4, No.1).